Probably like a lot of people, I’ve had fungal toenails since my 20s. Back then I played a fair bit of rugby. Although that was a long time ago, the fungal infection I picked up under both my big toenails has stubbornly stuck around. Over the years, I’ve tried many of the over the counter treatments, and nothing seemed to work. I became resigned to the fact that my toenails would forever be infected. But today, both my big toenails have a clear, pink base from the cuticle leading 50% up the nail. This might not sound like a lot, but I think it’s amazing! This is what worked for me. Have a read and decide for yourself whether you want to give it a try. Early last year, I read that tea tree oil topically applied to the toenail was an effective treatment for fungal infections. I thought it was worth a shot. So, for six months, I applied a few drops to each toenail most mornings after showering, rubbing it into the nail and the surrounding skin. I gradually noticed a definite improvement. The crumbly nature of the nails disappeared, and the infection seemed under control. But it didn’t go away. Then I read about the power of garlic, which I’ve always loved in food. I didn’t realise what an amazing plant it is. A few things really helped me decide to embrace the medicinal benefits of garlic, including this Youtube video and Enon Valley’s helpful guide. Each evening, I peel one clove of garlic, break it in half and leave it in the bottom of an empty glass for a few minutes to let it react with the air. First thing in the morning, I drink my glass of garlic water and refill with cold water, drinking a few glasses of the garlic water before I start my day. It’s more refreshing than you’d think! If I am intermittent fasting (IF) that day, I throw the clove away afterwards. If I am working in the office, I will repeat this process and drink garlic water all morning. I then break my fast by eating the garlic clove just before going for lunch. Repeat as often as you can each week! This is now something I’d wholeheartedly recommend to any runners who suffer with fungal toenails or fungal skin infections on their feet. I know it might sound a bit sad, but I’m over the moon about having normal, clean toes again… At least until April when I run Centurion’s South Downs Way 50, at which point those lovely toenails might take a hit. I’d love to know how you get on if you try the same method. It might not be everyone’s cup of tea (or cup of garlic water) but I’ve been amazed by the positive effects I’ve felt. Leave me a comment below or drop me a line at andy@lifeisasinecurve.com. 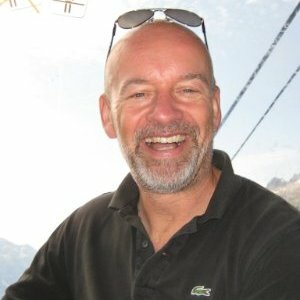 I’m a business and endurance running coach – find out more at www.xnrg.co.uk. Which very slowly is making a big improvement by applying vicks to my nails after a shower. About a long outstanding corn thst was giving me pain. I told her about the vicks and she said that it did work but i had too file the front of my nails before a shower and then apply. The brittleness has gone and nails are looking much better. I will try the garlic and hit it from the inside as well. Also found the vicks generally made my feet feel quite refreshed and got rid of athletes foot and they smell nice. That’s terrific Jeremy, thanks so much for sharing. I will also try the Vick and fast track the progress!